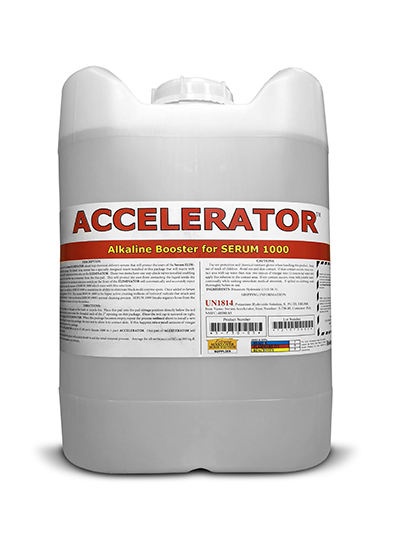 Serum 1000 Accelerator is a chemical additive designed to hyper-accelerate the chemical properties of Serum 1000 to achieve a highly potent organic contamination and mold staining removal product. Serum 1000 Accelerator not only speeds up the rate at which Serum 1000 works and cleans surfaces, it also greatly improves the products ability to bleach out any organic staining cause by mold and mildew on difficult to clean surfaces. Only for use with Serum Systems Serum 1000 product made by Serum Systems. The Accelerator additive is designed to cause Serum 1000 to create billions of hydroxyl radicals to super charge it's bleaching qualities. Now with the Accelerator, you can clean the organics faster because of it's super excited state and be assured that all the staining will be bleached away improving the aesthetics of all surfaces being cleaned. The specialty packaged gallon of Accelerator is designed for use with the Eliminator MINI Soft Wash System.